As I hear clanging and banging coming from the basement, it’s a good sign for me. 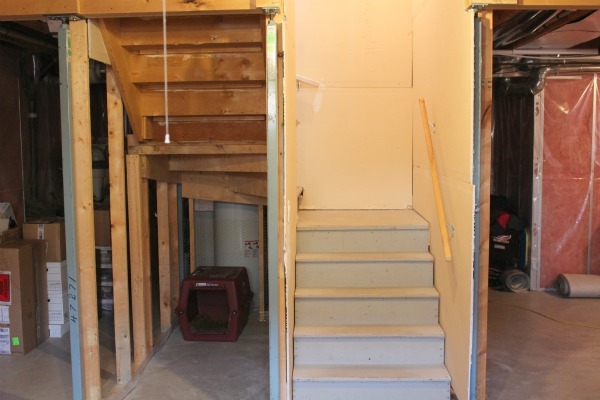 We’ve been planning our basement renovation for several months now and it’s finally underway. Yesterday, everything was mapped out on the floor and the rest of the week will involve framing, with the electrical work starting on Monday. Although we’ve put a lot of thought in to the design, there are always obstacles that come up in any renovation. I’ve already had to make some quick decisions about door placement and exactly how high we want the flat screen TV mounted on the wall. With my husband being away on business this week, I’m feeling a little pressure and I’m crossing my fingers that it will be in the right spot. One feature we want in the media room is a snack bar (similar to a wet bar, but without the sink). We decided the best place for it is within the niche below the stairs and it will serve as a place to store a few snacks, some glasses, bowls and beverages. We’ve decided to install a stainless steel beverage fridge (which I’ve already changed from my previous basement post as I didn’t like the quality when I took it out of the box), as well as a base cabinet with a drawer and door. What we’re still determining is whether or not we want open shelving up top or a cabinet with double glass doors. This will influence the placement of the lighting, as well, to either overhead or under cabinet. I love the cabinet paint color, as well as the backsplash of this wet bar configuration spotted on Decor Pad. If we decide to go with glass door uppers, I may paint the cabinet interiors a pop of color like these ones found on Better Homes and Gardens. Or perhaps we’ll do a classic white cabinet scheme similar to this one shown on Houzz. I adore the look of open shelving in this photo from House Beautiful, but I question how practical it will be. Do I really want to add more dusting to our weekly routine? Is it worth it? The space under the stairs only measures about 37″ wide, so the configuration is limited. Here is a pre-construction photo. As you can see it needs a lot of work, but with some cabinets, a beautiful backsplash, solid surface countertop and lighting, I think it will really transform. What do you think? Would you do a closed cabinet up top with glass doors or opt for open shelving? I’d love to have your input, as this is one more decision I have to make asap! I’m off to my niece’s graduation later today, so I’ll see you next week. Enjoy your weekend and have a beautiful Mother’s Day! Fun, fun, fun!!! Can’t wait to see the progress! Thanks Shannon! It’s exciting to finally be underway, but a bit stressful with all the decisions, as I’m sure you’ve gone through with all your renovations. Shauna, I agree with you on adoring the open shelf look but I think the glass doors is more practical and I also love the look of glass doors . With the busy lives we all lead we don’t need to add more work to our already overwhelming schedules. I think it would be annoying to be down relaxing for a movie and having to run upstairs to wash the dust off your glasses. I find is amazing how dusty our basement bookcases get even when we are not down there that much. Of course on the farm we have more dust than you have in the city. When I see open shelves in magazine kitchens, I love the look but I think it only works in magazines. Just my opinion. Good luck, it’s going to be awesome! Thanks for the input. That’s what Kerri said too! Yay! So exciting when work gets underway. You’ve got some great inspiration pics here. I normally go for open shelving as it is more casual and also gives a feeling of more space. However, if you go with uppers, those glass front cabinets with colour in the back would be fantastic and fun. Thanks for your input. I’m leaning towards the glass front cabinets, but I may change my mind over the weekend- who knows! Love that wet bar area! How excited you must be! Can’t wait to see the progress. Love the idea of the wetbar! Great inspiration pics… can’ t wait to see what you are going to do!